For the past year, I have only been using two methods to treat drinking water while backpacking. When in camp, I boil the water that I will use for cooking or making hot drinks. When on the trail, I use Aquamira Water Treatment drops. Aquamira has many benefits over other treatment methods. They are fast, easy, lightweight, reliable, and scalable. Aquamira uses Chlorine Dioxide, the same water treatment chemical used for municipal water treatment since the 1940’s. When the two part solution is mixed, aquamira releases powerful oxidizers into the water, killing any pathogens that exist. Chlorine dioxide drops are very easy to use. First, combine 8 drops of Part A with 8 drops of Part B in the small cap that comes with the kit. Wait about 5 minutes for the two parts to react. You know they have reacted when they turn yellow. Add the drops to 1 liter of water. Most of the time, water is drinkable in just 15 minutes. If the water is very cold or dirty, you should wait 30 minutes. Chlorine Dioxide are scalable. You use 8 drops of Part A and 8 drops of Part B for every liter of water you need to treat. For simplicity, remember that 1 liter is about 1 quart and that 1 gallon is about 4 liters or 4 quarts. Scalable: filtering 2 liters of water takes twice as long as treating 1 liter. Treating 2 liters with chlorine dioxide takes only a few more seconds than treating one. Faster: Filtering requires standing around. With chlorine dioxide, you add the drops and go. Better Taste: Chlorine dioxide leaves almost no taste in the water. Scalable: Most UV systems can treat either a liter or a half liter at a time. Chlorine dioxide can treat many gallons simultaneously if you have enough of it. Faster: Just add the drops and go, no need to stand around stirring your water. More Adaptable: Using a UV system requires a wide mouth bottle where chlorine dioxide works in any bottle. A 1 oz. 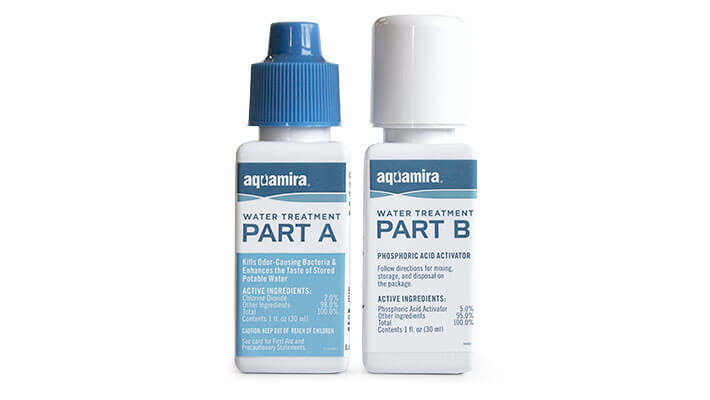 set of Aquamira comes with one cap for mixing Part A and Part B. Instead of using these caps, you can mix the parts right in the cap of your water bottle. My Nalgene bottles don’t have little caps, but sometimes I like to treat more than one bottle at a time. Every time I use up a set of Aquamira drops, I save the cap and add it to the next set so that I have two caps. I use Aquamira to treat the first batch of clean water that I put into a soft bladder that has been in storage for a while. This takes care of anything that might have grown in there. Thanks Jay for this article. Is there any kind of container you should not use? I would be s bit concerned of the oxidation reaction to the composition of some plastic bottles. The manufacturer doesn’t issue any warnings about this, and a quick google search doesn’t show anything either. I use the semi-soft BPA Free wide-mouth Nalgene bottles.